Home » IYIM NEWS AND EVENTS » Knesset Constitution, Law and Justice Committee hears from Dr. Levmore! At a Knesset meeting of the Constitution, Law and Justice Committee, the director of the IYIM Project for the Prevention of Agunot and Get-Refusal, Dr. Rachel Levmore, spoke and presented her solution to a hotly contested bill. The subject of the controversy was a proposed amendment to the law, granting jurisdiction to the Israeli Rabbinical Court jurisdiction over get-refusers who are not citizens or residents of the State of Israel. The proposal was made to resolve the plight of agunot residing abroad (non-citizens) who found that they have no recourse in their home countries, as local rabbinic authorities are helpless to compel the husband to give the get. 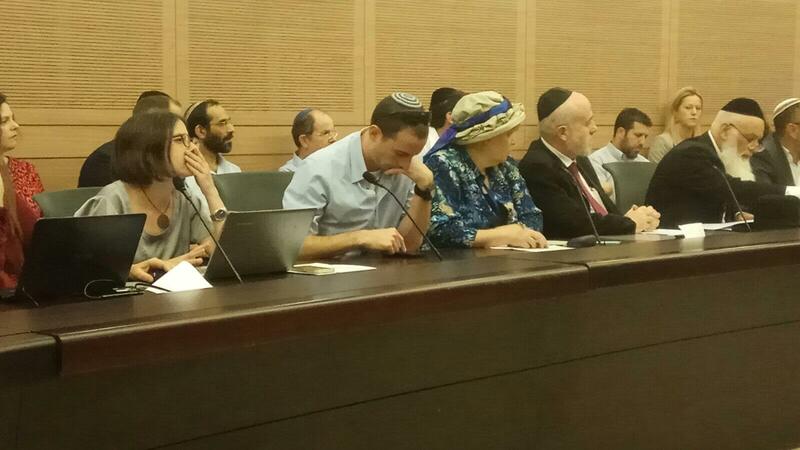 Dr. Levmore happened to be sitting next to the Director and legal counsel to the Directorate of the Israeli Rabbinical courts, which afforded her the opportunity to speak directly to them aside from her presentation to the Committee, MKs and the dozens of interested parties present. This brought about a softening of the Directorate’s stance leading on to further dialogue—hopefully reaching a good amendment which will help international agunot.